Host your next event at Blank Park Zoo! We offer a variety of spaces as well as activities to make your event truly unique. Invite animals to be up close and personal with your guests and enjoy reduced admission to Iowa's Wildest Adventure. From small team meetings to company retreats and outings, the Zoo will make a lasting impression on your guests. Bridal showers, baby showers, graduation parties, holiday parties, the possibilities are endless! Pavilion | $1,200 The covered, outdoor space is a beautiful location for up to 200 guests for ceremony. 120-150 for reception. Discovery Center | $1,000 The indoor space overlooking the rainforest accommodates up to 120 guests. African Pavilion | $500 A great space foe a quaint wedding or intimate cocktail hour of 40 guests or less. Aquarium | $700 A truly unique wedding location for under 40 guests. Zooplex | $1,000 The perfect reception venue for 300+ guests. Premium Reception | $3,400 Dinner and dancing in the location of your choice. Use of outdoor and indoor exhibits exclusively for your guests at no additional cost. Deluxe Reception | $2,700 Dinner and dancing in the location of your choice. Use of indoor exhibits open exclusively for your guests at no additional cost. Zoo Reception | $2,400 Dinner and dancing in the location of your choice. The room overlooks our indoor exhibit and can seat up to 130 guests. 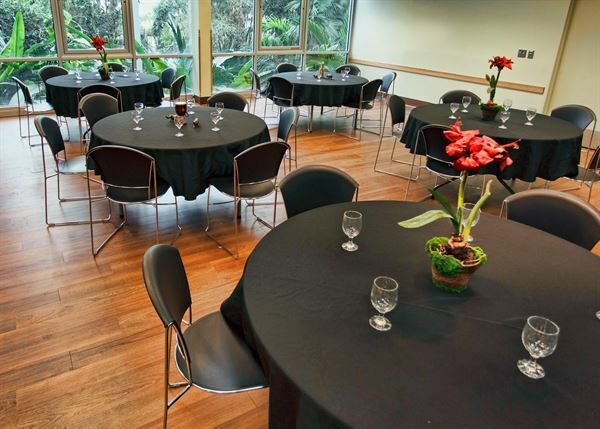 With the option to customize the size of the room, the Discovery Center is perfect for small gathering or large dinner parties. The Palm Expanded Room is comprised of our Palm and Tamarin Rooms. With the divider wall, the Palm Room can seat 40 guests and the Tamarin Room can seat 15 guests. As one large space, up to 60 guests can be seated.